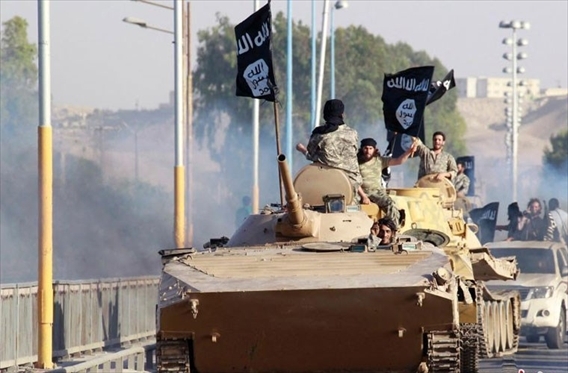 The ISIS terrorist army are accumulating a growing arsenal of weaponry captured from overrun Syrian and Iraqi military bases and weapons’ depots as they rampage across the Middle East. 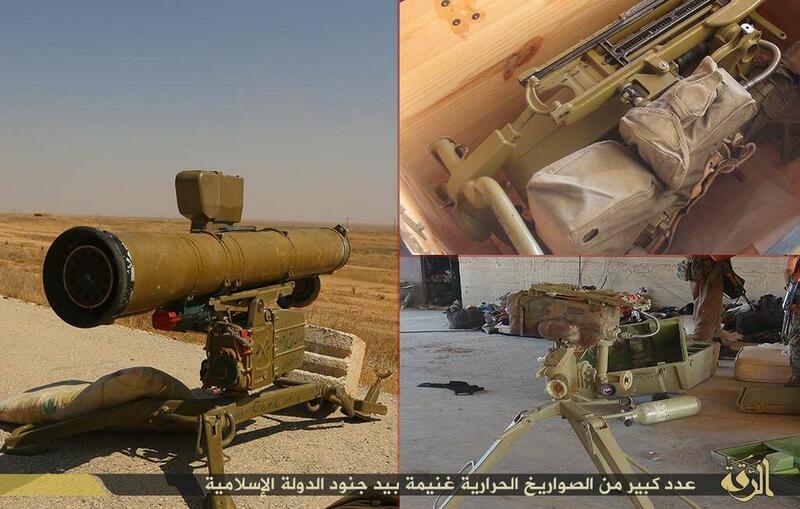 So, I’d thought I’d list some of the more common weapons used by ISIS in Syria and Iraq, along with some of the newer weapons they’ve managed to get their hands as of late. 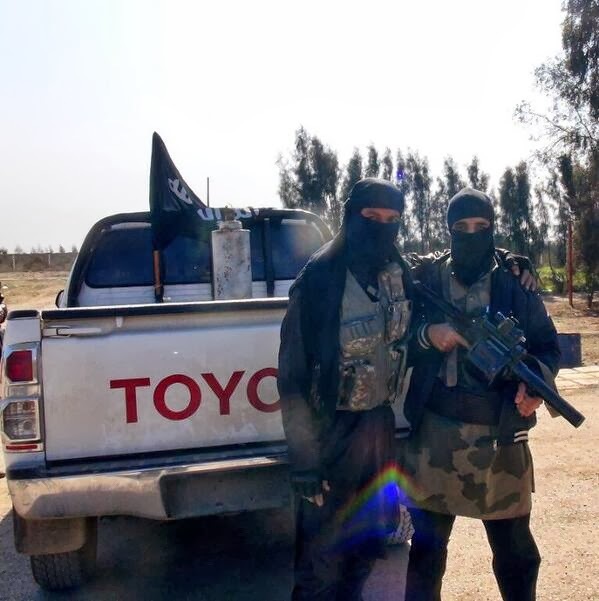 This is by no means meant to be an exhaustive and comprehensive list of weapon systems being used by ISIS, et al., but rather a list of some of the more commonly used weapons, and few rare ones as well. The list is fairly long. So I decided to break it up into three parts. Let’s have a gander, shall we? 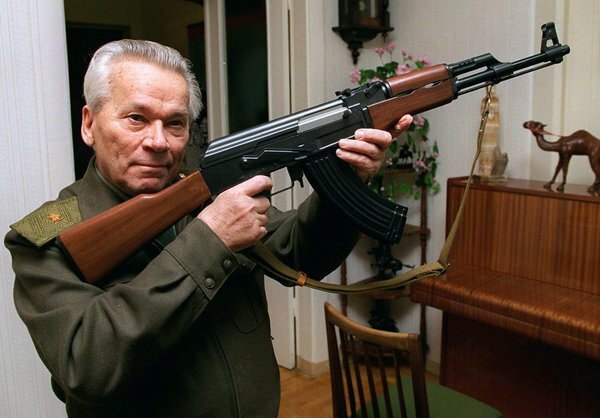 Mikhail Kalashnikov, developer of the AK-47 rifle. One of the most common weapons employed by Islamic terrorists worldwide is the ubiquitous Russian-designed AK-47 rifle (a.k.a. 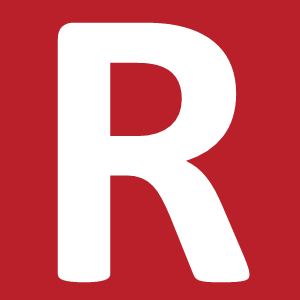 “Kalashnikov”). The Kalashnikov is named after its designer—Mikhail Kalashnikov. 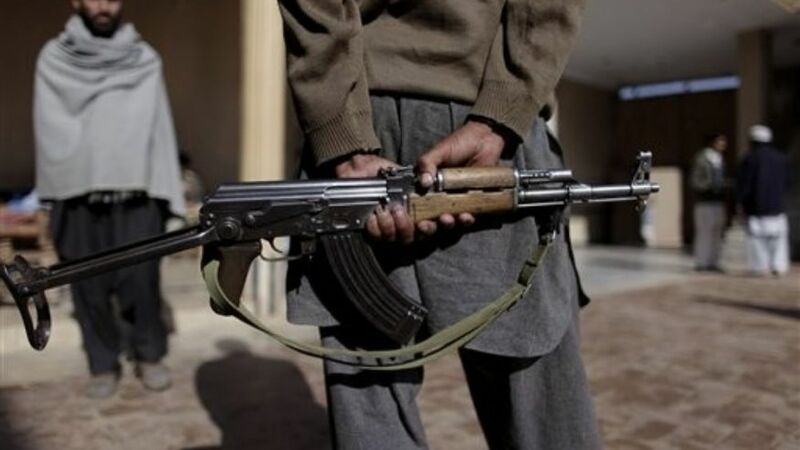 The AK-47 is a select-fire—meaning, it can fire in both full-auto and semi-auto modes via a selection lever located on the right-side of the receiver—gas-operated rifle chambered to fire the 7.62×39mm round. 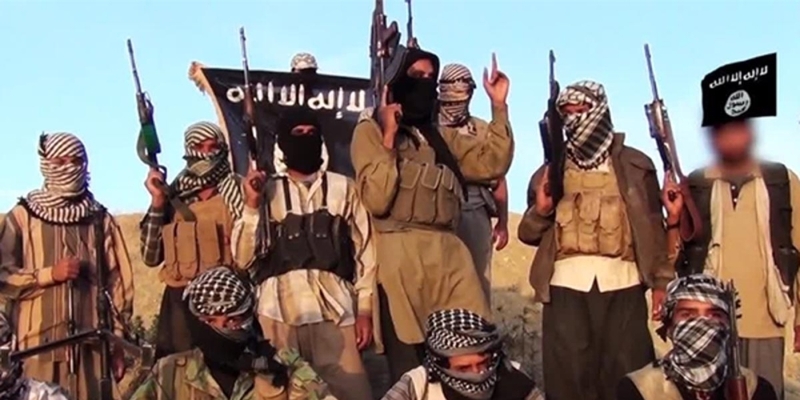 The AK-47 has an effective range of roughly 300-400 meters. 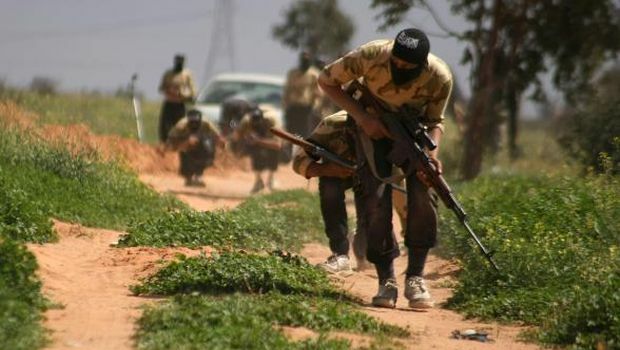 The Russian-designed Dragunov sniper rifle is probably the most common sniper rifle employed by Islamic terrorists worldwide. The Dragunov is a semi-automatic rifle chambered to fire the 7.62x54mm rimmed round (7.62x54R). Military versions typically feature a detachable 10-round magazine and a telescopic scope. The Dragunov has an effective range of approximately 800 meters. 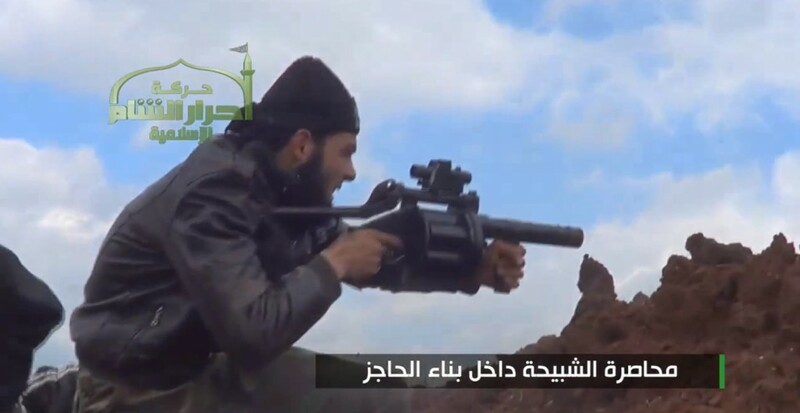 The Russian-designed PKM is the most common belt-fed machine gun used by Islamic terrorists worldwide, and also fires the 7.62x54mm rimmed round. 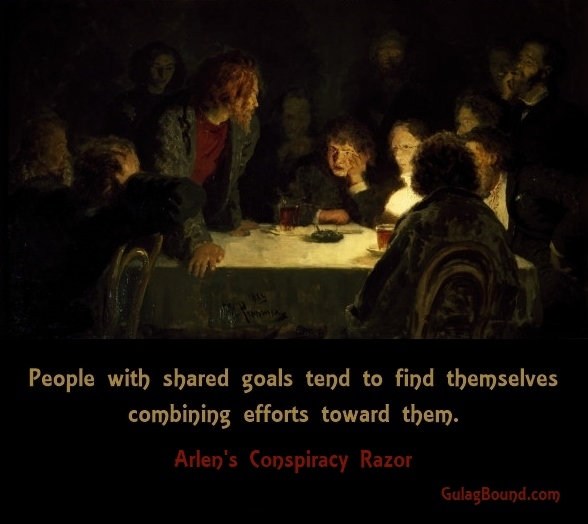 It’s a very effective and reliable weapon, hence its widespread use. 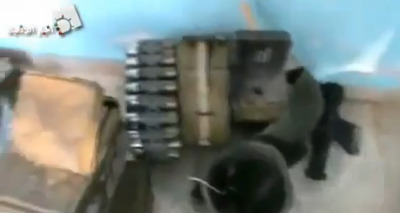 It’s common to see a 100-round box magazine used with the PKM. 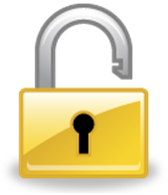 There are various version of the MG, such as the PK, PKS and PKMS. 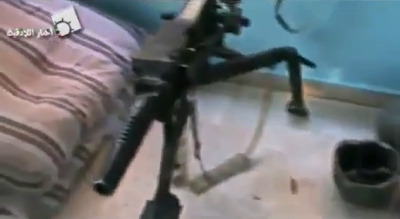 The Chinese Type 90 belt-fed machine gun is based on the PKM design. The PK series has an effective range of roughly 1,000 meters, and a rate of fire of around 650-750 RPM. 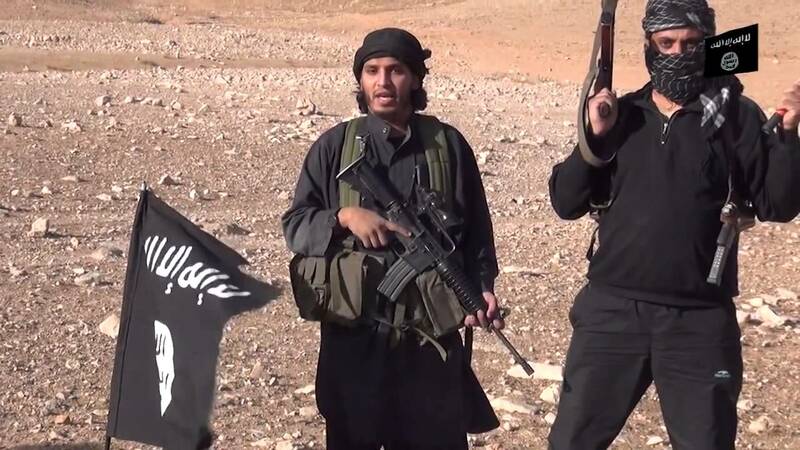 ISIS terrorist with American-made M-4 rifle. American-made M-16 rifle with scope. The American-made M-16 has been the standard-issue rifle for the U.S. military since the Vietnam war, and is in service with many armies around the world. The M-4 rifle is the carbine version of the M-16. Military versions M-16/M-4 are gas-operated, select-fire weapons chambered for the 5.56x45mm NATO round, and typically feature a standard capacity magazine holding 30 rounds. The civilian version of the M-16 is the semi-automatic AR-15 rifle. 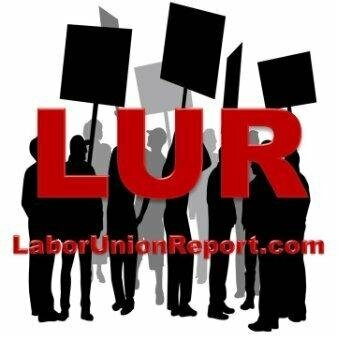 The AR-15 is not a select-fire military-grade weapon. The M-16 has an effective range up to 550 meters. The M-4 carbine version has an effective range of roughly 500 meters. 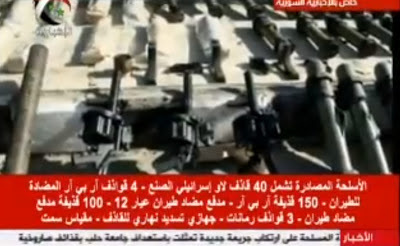 The Chinese M99 sniper rifle caused a lot of consternation when it first appeared on the battlefield in Syria due to an Al-Arabiya article that misidentified the M99 with the British AS-50 sniper rifle (one of the best in the world). While the Chinese M99 is a formidable weapon, it is not quite up to “Western sniping standards.” The Chinese M99 is an attempted answer to Western sniper rifles like the British AS-50 and the American M107 Barrett, which have proven highly effective in combat in both Afghanistan and Iraq. The M99 is primarily designed for anti-materiel work—like shooting through engine blocks or walls—or short-range enemy sniper suppression. The M99 is available in both 12.7x108mm (M99-I) and 12.7x99mm/.50BMG (M99-II) caliber versions. 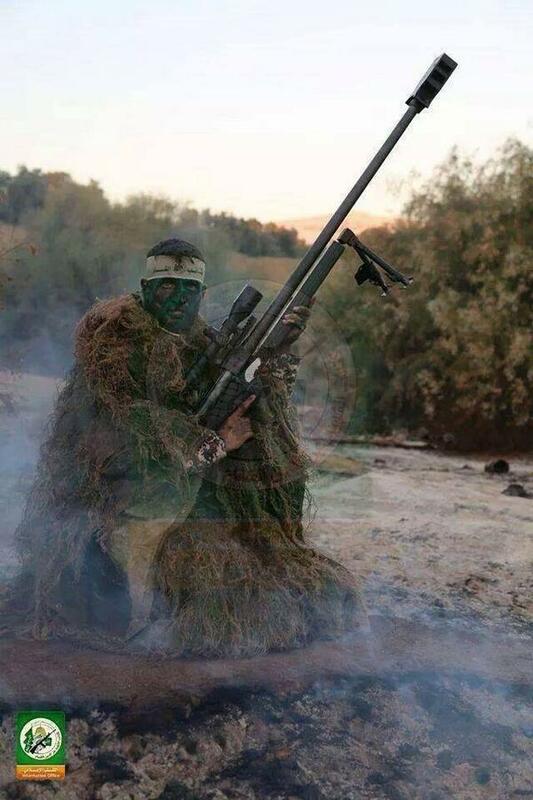 The M99 has a maximum effective range up to 1,500 meters. 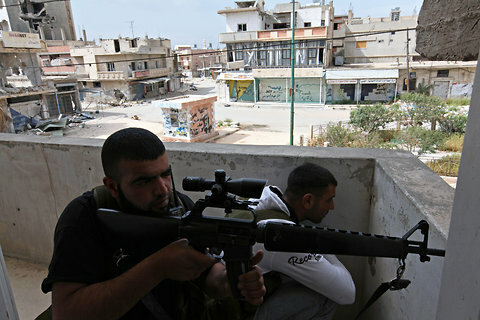 While not a commonplace sight, the Russian Degtyarev 6S8/6S8-1 12.7mm anti-material/sniper rifle is starting to make an appearance in the war-torn regions of Syria and Iraq. 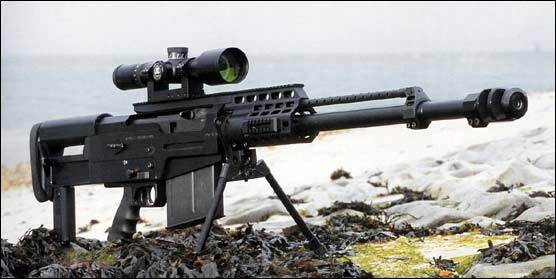 The 6S8/6S8-1 is chambered for the 12.7mmx107 sniper round and features a sliding bolt action, five-round magazine in a bullpup configuration, and has an effective range of 1,500 meters (maximum range 2,000 meters). The Soviet-designed DShK 1938 HMG is a 12.7x109mm, gas-operated, belt-fed, air-cooled machine gun that fires from an open bolt and in automatic mode only. 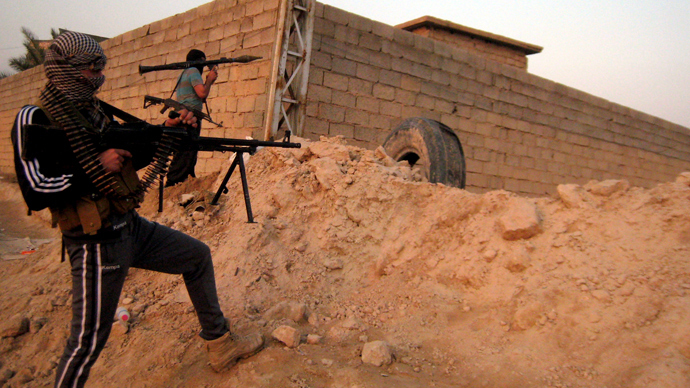 The DShK (nicknamed “dushka”) has a rate of fire of approximately 600 rounds per minute (RPM) using 50 round belts. The DShK became the standard Soviet heavy machine gun in WWII, and was used as both an AA (anti-aircraft) HMG and a turret-mounted auxiliary weapon on Soviet tanks. The “dushka” has an effective range of 2,000 meters. 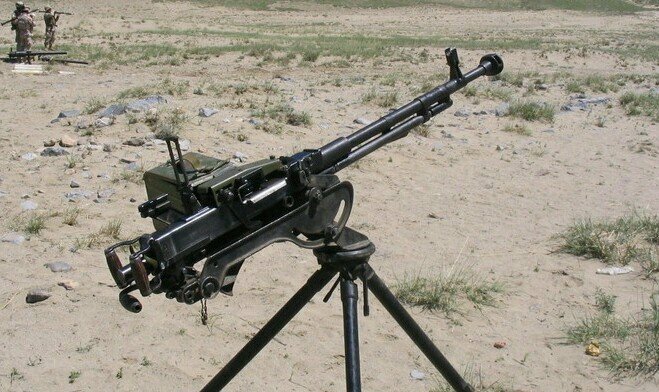 The Russian NSV heavy machine gun was developed in the late 60?s as a lighter version of the DShK HMG and fires the same 12.7x109mm DShK round. 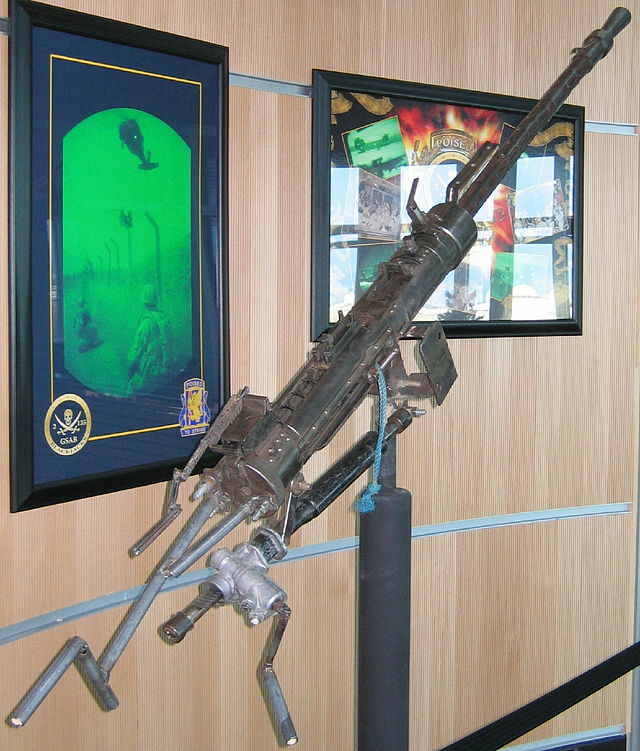 The NSV HMG is a gas-operated, air-cooled machine gun and features a quick-change barrel. The NSV has a slighter higher rate of fire (700-800 RPM) than the heavier DShK HMG. Another version of the NSV is the NSVT, designed for mounting on tanks and armored vehicles. An improved version of the NSV HMG is the Kord 12.7mm HMG. The NSV has an effective range of up to 2 km against ground targets, and 1.5 km vertically, and a 600 RPM rate of fire. 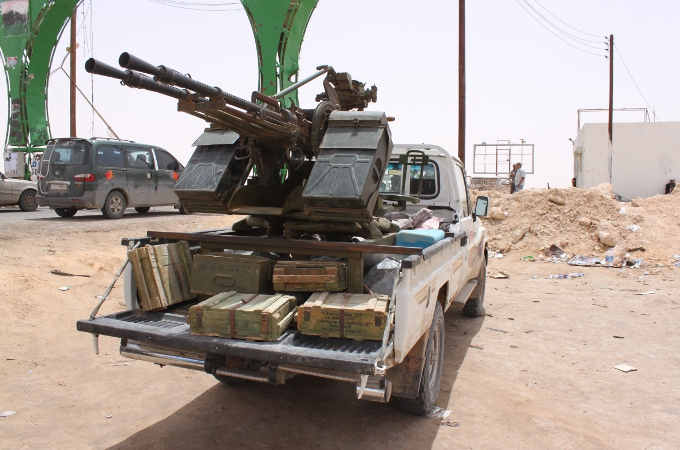 KPV 14.5 mm heavy machine gun. KPVT (tank version) 14.5 mm heavy machine gun. 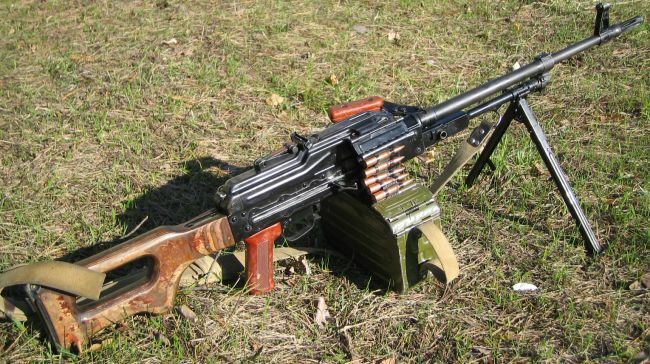 The Soviet-designed KPV heavy machine gun was originally developed in 1949 as an infantry weapon (designated PKP), but it was taken out of production for being too big and heavy. It was later redesigned in the 60?s as an anti-aircraft weapon. 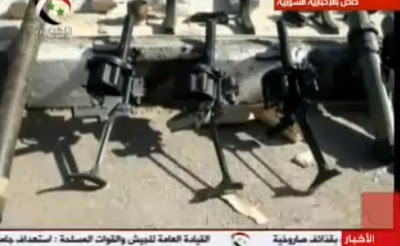 Double-barrel and four-barrel versions of the KPV 14.5mm HMG are known as the ZPU-2 and ZPU-4 respectively. 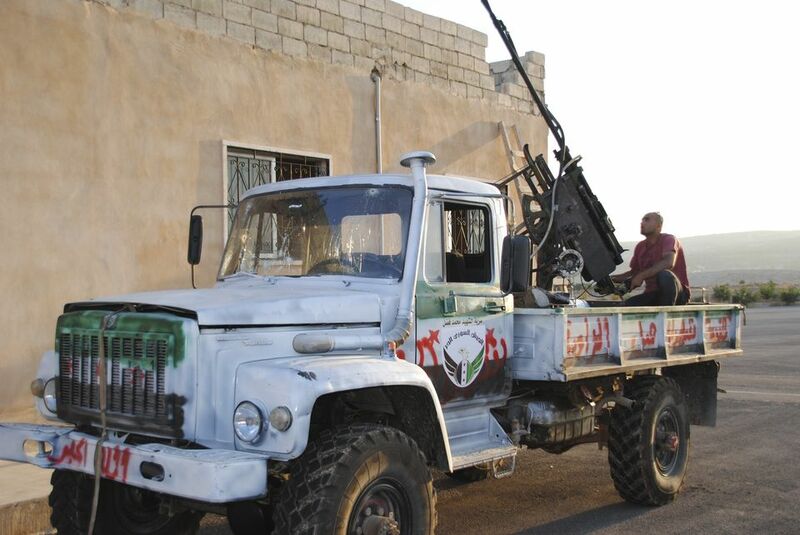 The single-barrel KPV is often seen mounted to technicals in the Syrian and Iraqi conflicts, as well as ZPU-2 and ZPU-4 configurations. The tank-mounted version of the KPV is known as the KPVT. 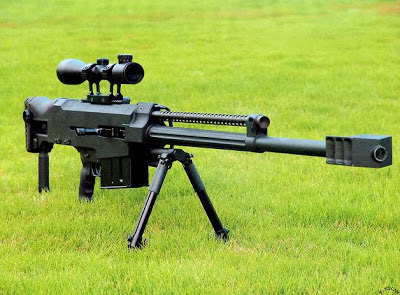 The KPV has an effective range of 3,000 meters (4,000 meters maximum) and a 600 RPM rate of fire. 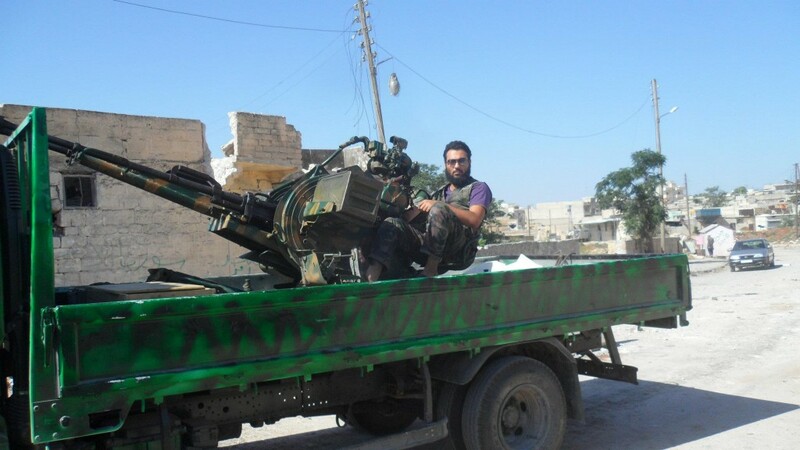 Double-barrel AA gun utilizing the KPV 14.5mm heavy machine gun. 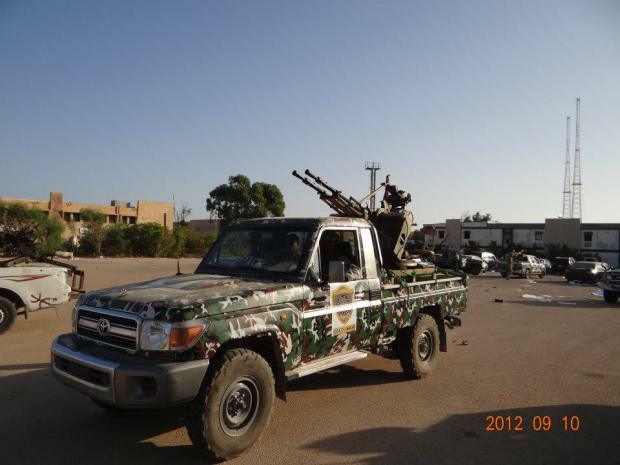 Four-barrel AA gun utilizing the KPV 14.5mm heavy machine gun. 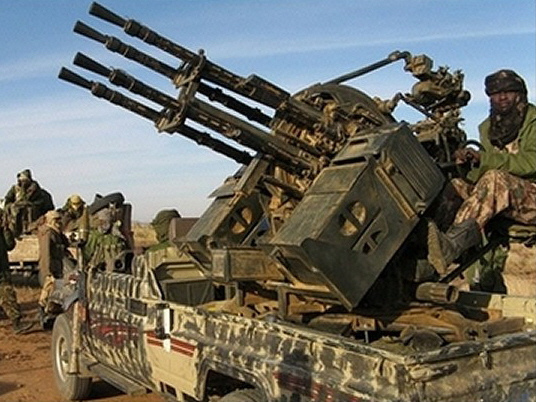 The 2A7 is a 23mm automatic anti-aircraft cannon intended for air defense gun systems such as the ZU-23-2 (see below). The 2A7 23mm has an effective of up to 2.5km (2 miles). 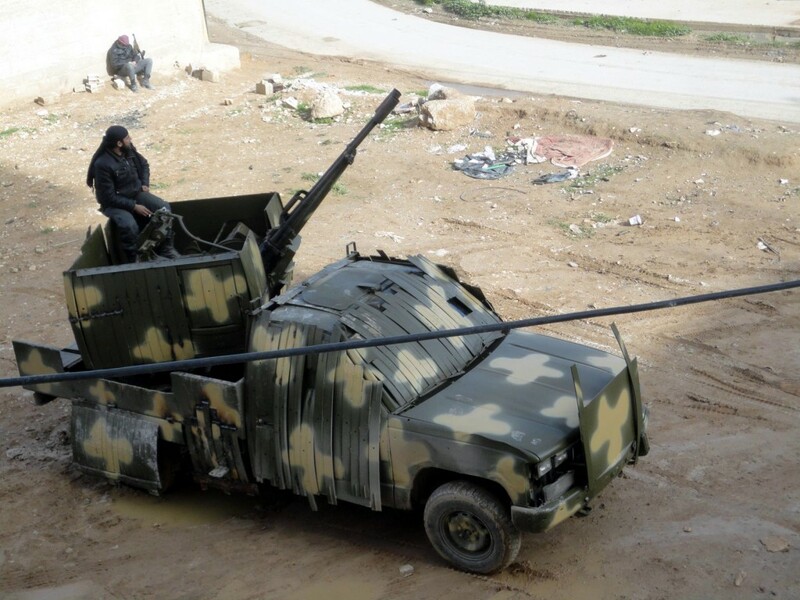 The Soviet-designed ZU-23-2 (2A13) mounts two 2A14 23 mm autocannons and has a practical rate of fire of around 400 RPM (2000 RPM cyclic). 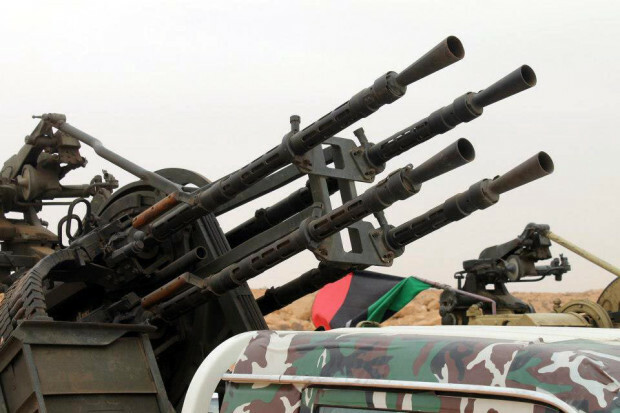 Ammo is fed by a conveyor belt from two 50-round ammunition boxes that are mounted perpendicularly on each side of the gun, which distinguishes the ZU-23-2 from the ZPU-2 14.5mm AA autocannon. 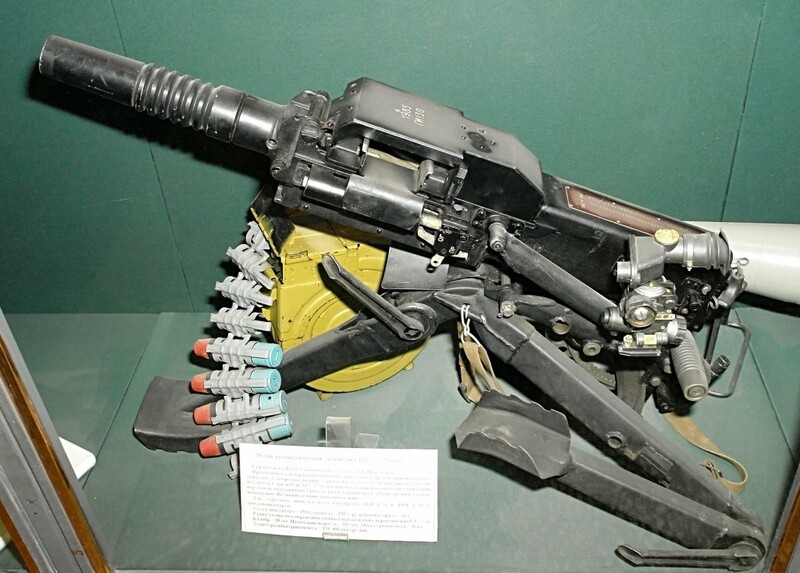 The Soviet-designed AGS-17 automatic grenade launcher can fire 30mm grenades at a rate of up to 400 rounds/min. 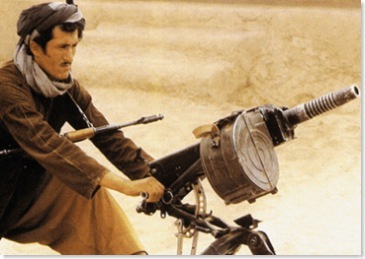 The AGS-17 was widely operated by Soviet troops in both Afghanistan and Chechnya, and was well-liked for its heavy firepower. The AGS-17 has an effective range of 1,700 meters. The RBG-6 grenade launcher was originally developed in South Africa as the Milkor MGL, manufactured under license in a number of countries, including Croatia, where it is known as the RBG-6. The RBG-6 has an effective range of 375 meters. 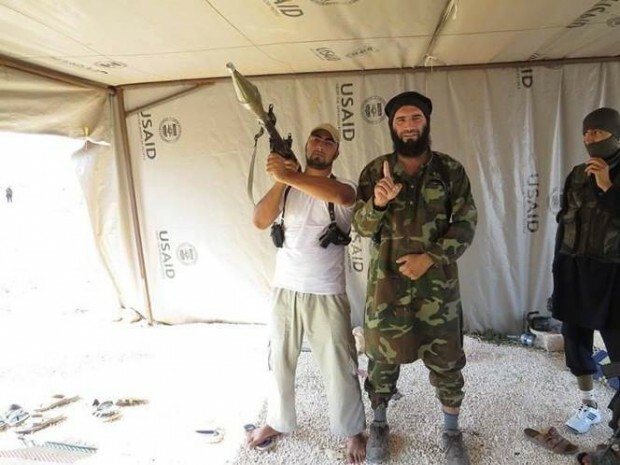 The ubiquitous RPG-7 is a mainstay of Islamic terrorists worldwide. 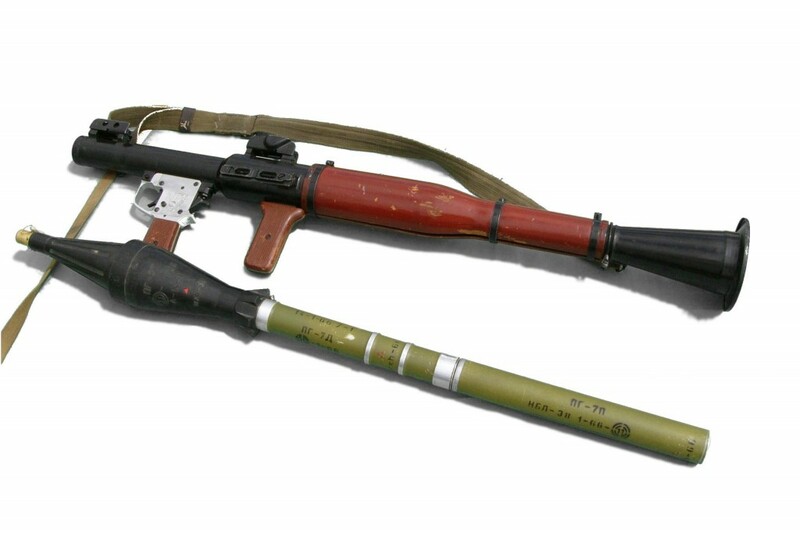 The RPG-7 is a portable, unguided, shoulder-launched, anti-tank rocket-propelled grenade launcher. 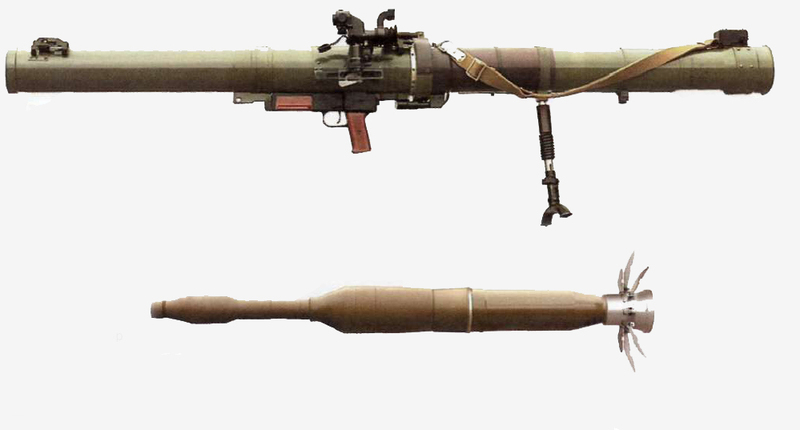 Originally developed by the Soviets to take out main-battle tanks and hardened targets, the RPG-7 can fire various types of rockets, such as single-stage HEAT (high-explosive, anti-tank), tandem-charge HEAT, fragmentation and thermobaric. Due to its ruggedness, simplicity, low-cost and effectiveness, it has become one of the world’s most popular anti-armor weapons. 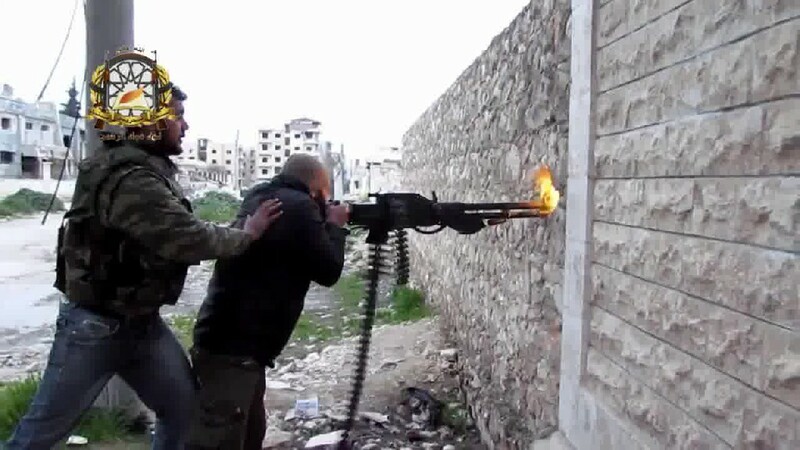 The RPG-7 has an effective range of 200 meters. 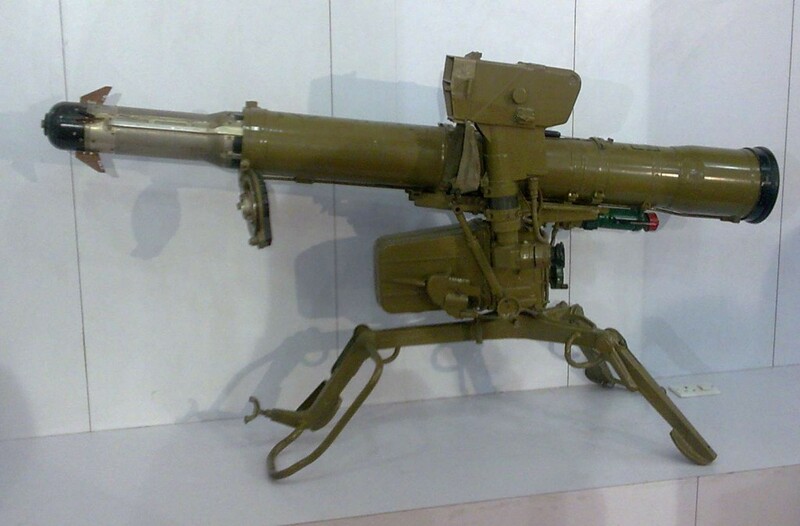 The Soviet RPG-22 Netto is a one-shot disposable anti-tank rocket launcher first deployed in 1985, based on the RPG-18 rocket launcher, but firing a larger 72.5 mm fin stabilised projectile. The weapon fires an unguided projectile, can be prepared to fire in around 10 seconds, and can penetrate 400 mm of armour, 1.2 metres of brick or 1 metre of reinforced concrete. The RPG-22 has an effective of range of 150-200 meters. 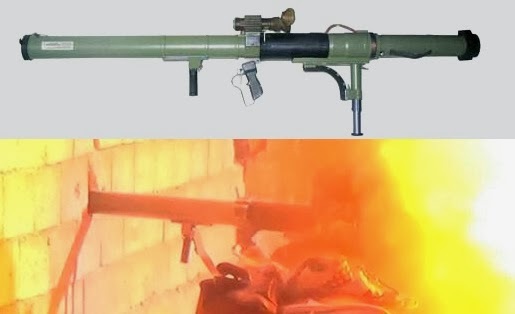 The RPG-29 is a portable, shoulder-launched, rocket-propelled grenade launcher developed by the Soviets in the late-80?s, which resembles more of a “bazooka” than an old-school RPG-7. The RPG-29 fires the lethal PG-29V tandem-charge warhead, capable of defeating the composite armor of modern main-battle tanks (MBT)—one of the few warhead systems capable of defeating reactive and composite MBT armor systems. The RPG-29 has an effective range of roughly 500 meters, and up to 800 meters with tripod and fire control unit. 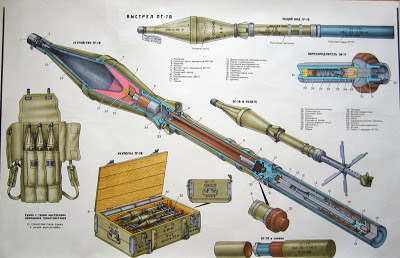 The M79 OSA is a portable, shoulder-launched, 90mm rocket-propelled grenade launcher developed in Yugoslavia and was based on the French 89 mm LRAC F1. 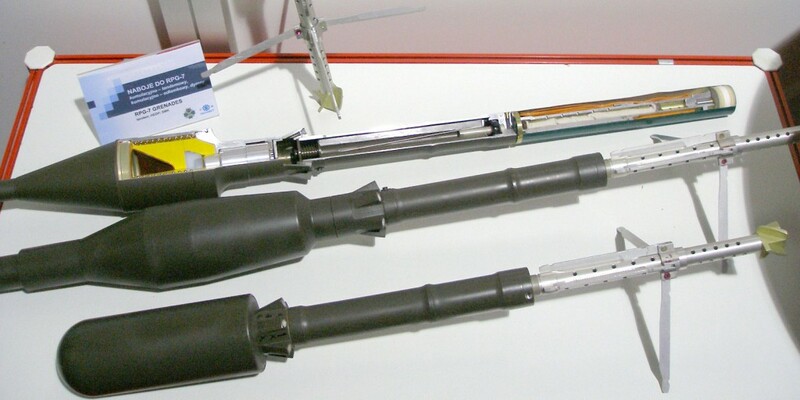 The M79 OSA is often times confused with the Russian RPG-29. The M79 OSA has an effective range of roughly 350 meters. The Russian-designed 9M113 Konkurs (NATO name: AT-5 “Spandrel”) is a wire-guided, roll-stablized SACLOS (semi-automatic command to line of sight) anti-tank guided missile system specifically designed to take out tanks and armored vehicles. The Spandrel was introduced in 1977 and has a maximum range of 4,000 meters and a minimum range of 100 meters, and can penetrate up to 600mm of rolled homogenous armor (RHA). 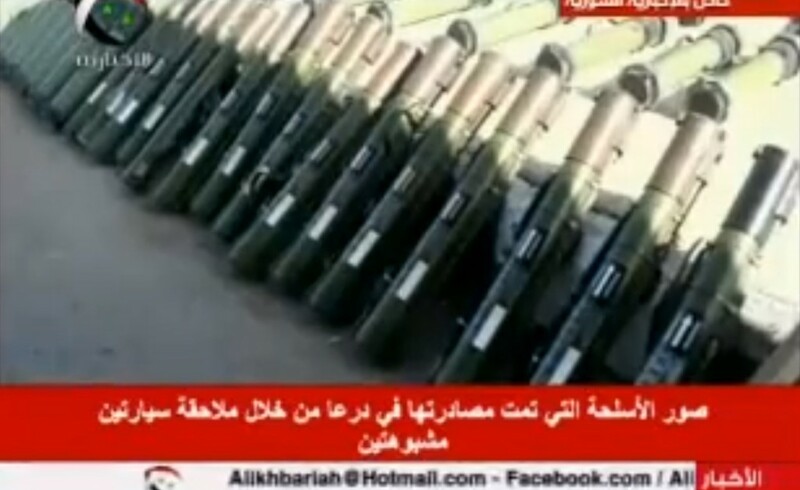 Other ATGM systems commonly used in the Syrian Civil War are the Chinese HJ-8, Russian 9K115-2 Metis-M, and the Russian 9M113 Kornet. 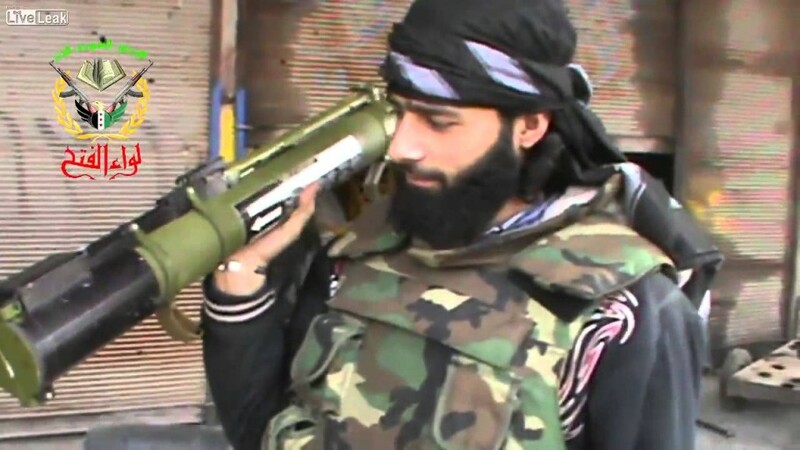 The Konkurs ATGM has an operational range from 70 meters to 4 km. Amazing shot of a Syrian T-55 fitted with a North Korean laser range finder experiencing a near miss by an anti-tank guided missile (ATGM). 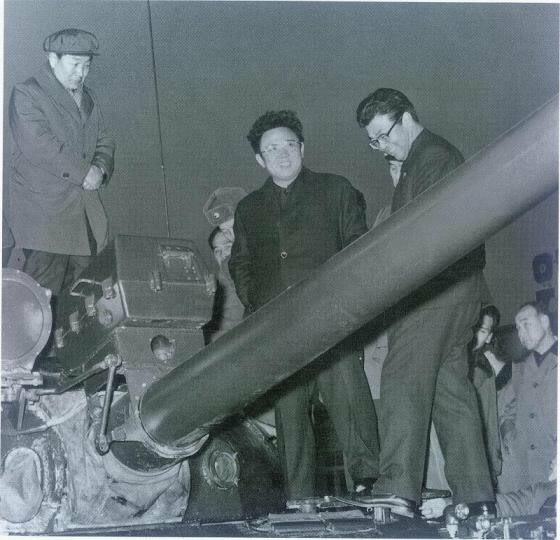 North Korean laser range finders were first seen on Syrian tanks in 1980 during the war in Lebanon. The Soviet-designed T-54/55 “medium” tank made its first appearance at the end of WWII, and is the world’s most-produced tank in history. Some 86,000 to 100,000 T-54/55?s are estimated to have been manufactured since the T-54/55 series was first introduced. The T-54/55 remains in service with some 50 nations around the world. Many T-55?s still in service have received extensive upgrades. The T-55?s main armament is the 100mm D-10T rifled cannon, and typically sports a coaxial- mounted 7.62m GWT machine gun, and one mounted in the front hull. 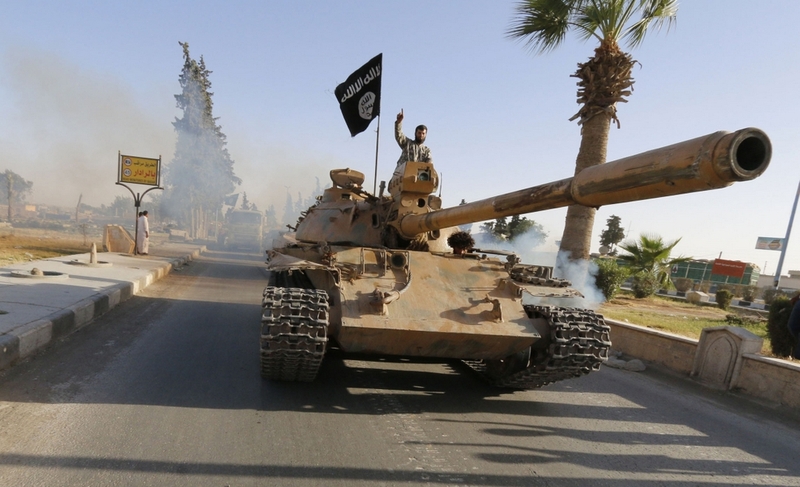 The T-55 is a very reliable and rugged tank design, but is highly vulnerable to modern anti-tank weapons. The Soviet-designed T-62 was a partial replacement and successor to the T-54/55 series. The main armament for the T-62 is a 115mm U5TS smoothbore cannon. The T-62 was produced between 1961 and 1975. The Soviet-designed T-72 main-battle tank was a front-line replacement for the T-62 and entered production in 1971. The T-72 is one of the most widely produced tanks in the world, second only to the T-54/55 series. While the T-72 was not as an advanced tank design as the Soviet T-64 tank, it was cheaper to produce. The T-72 has very good cross-country performance, presents a low-silhouette, exhibits high reliability, and packs a fair amount of firepower with its 125 mm 2A46M smoothbore gun. 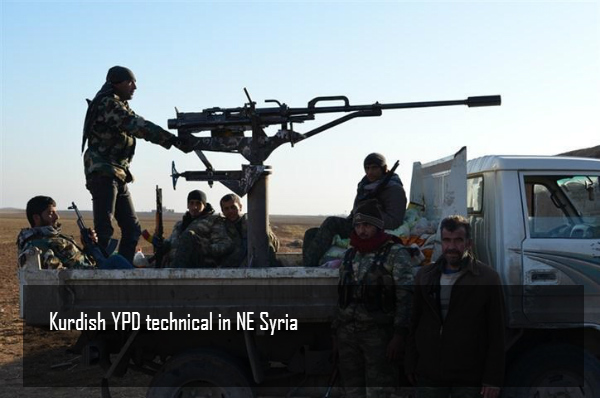 Secondary armament includes a 7.62mm coaxial mounted machine gun and a turret-mounted NVST 12.7mm heavy machine gun. Despite these favorable characteristics, the T-72 is still vulnerable to modern anti-tank threats, even with reactive armor upgrades. The T-72 is also outclassed by many Western MBT’s, such as the U.S. M1A2 Abrams, British Challenger II and the German Leopard 2. 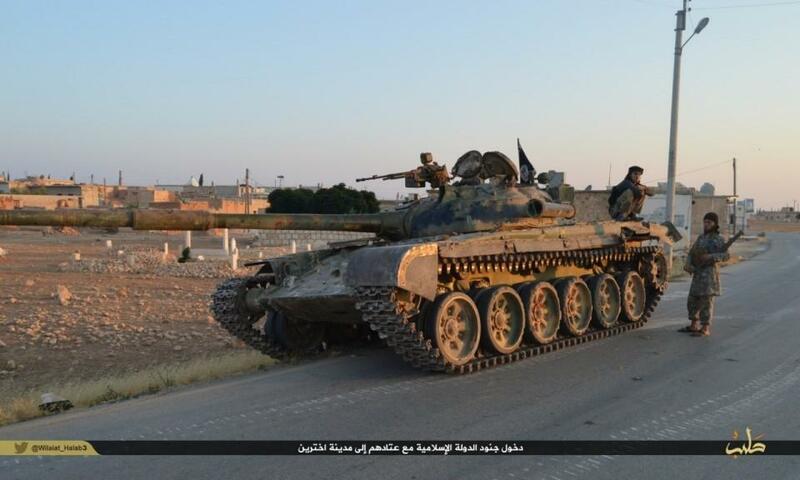 Syrian Assad Army (SAA) BMP-2 IFV passing a T-72 MBT. The Soviet-designed BMP-1 is a tracked amphibious infantry fighting vehicle originally designed to provide support for main-battle tank armored units. The BMP series is a cross between an armored personnel carrier (APC) and a light tank. The BMP-1 first entered service with the Soviet Army in 1966. It saw its first combat test during the 1973 Yom Kippur war where it was used by both Egyptian and Syrian forces. 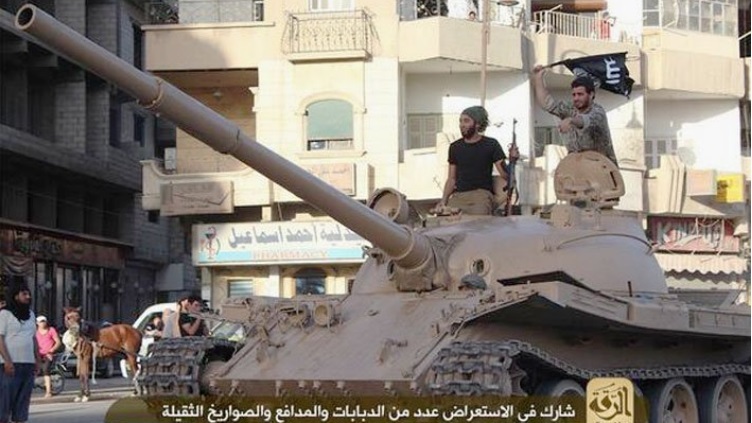 The BMP-1?s main armament is a 73mm 2A28 Grom low-pressure smoothbore short-recoil semi-automatic gun, secondary armament includes a 7.62 mm PKT coaxial machine gun. Lessons learned during the 1973 Yom Kippur war with Israel led to the development of the BMP-2, which was introduced in the 80?s. The 73mm gun on the BMP-1 was considered obsolete at this time. 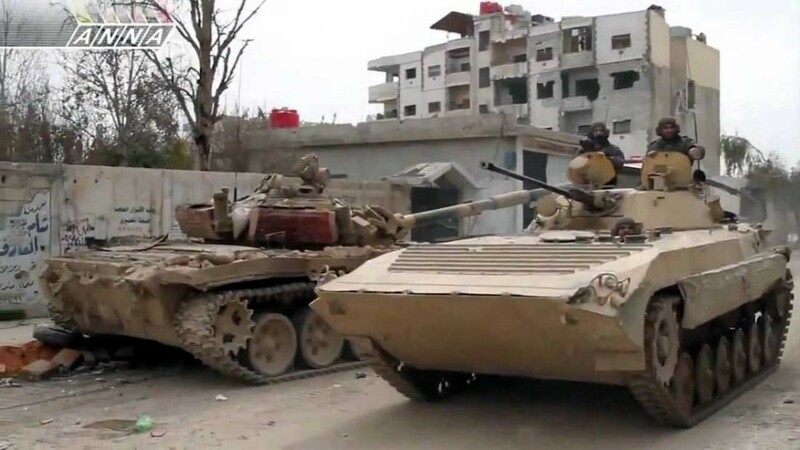 The second-generation BMP-2 replaced the 73mm gun with a 30mm 2A42 autocannon, and also added a 9M113 Konkurs ATGM for potential tank threats. 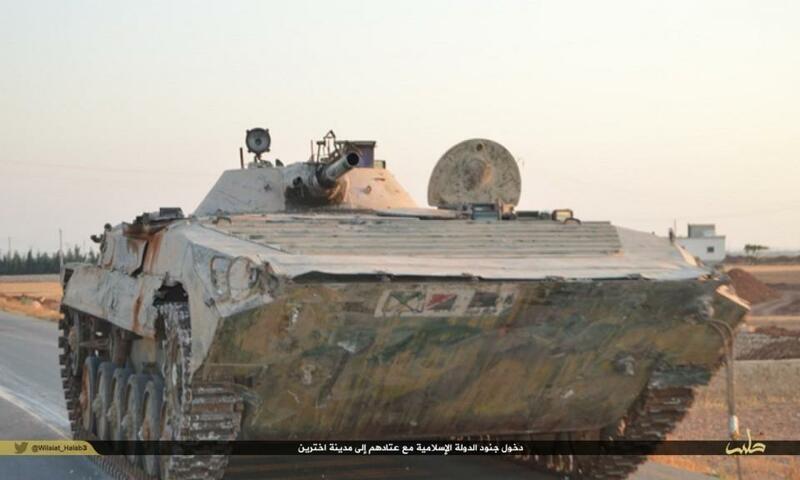 Nonetheless, both the BMP-1 and BMP-2 are highly susceptible to modern anti-tank weaponry.